Jamaicas culture, perfect beaches, fabulous reggae music, and year round warm weather, has made it one of the Caribbeans hottest vacation spots. However, if you havent considered Jamaica scuba diving...youre missing the boat. There are now designated marine parks in Negril, Montego Bay, and Port Antonio, which are resulting in increased numbers of fish and other marine life. Local Jamaica dive sites and professional Jamaican scuba diving operators add to its advantage as a preferred dive destination. Jamaican divers will appreciate pleasant year round weather and clear, warm waters which average 78-85 degrees Fahrenheit year round. Offshore Jamaica diving is most popular along the islands west and north coasts, especially in Negril, located on the west tip, where the water is almost ALWAYS calm because it is protected from waves and strong winds. Montego Bay, Ocho Rios and Runaway Bay are also popular dive destinations. Negril is home to seven miles of beautiful white sand beach. This sand and the Jamaican sun are the draw for this area. Accommodations range from the practical to the absolutely decadent. 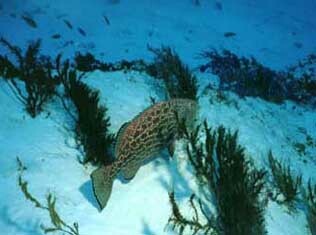 The diving is relaxed and typical coral reef residents can be observed and photographed. Negril has three reef areas, with most interest between 50 and 70 ft. Seas are dependably calm and the visibility often exceeds 100 ft. The underwater landscape has incredible caves and corals, as well as coral cottages" as deep as 60 plus feet. If wreck diving is your passion, there are some wrecks near the shore, including two Cessna planes encrusted with coral and a 50-foot tugboat called Pete Wreck. Learn about other fabulous dive sites in Negril by selecting one at the left.